There are no fresher herbs than those you've grown at home. 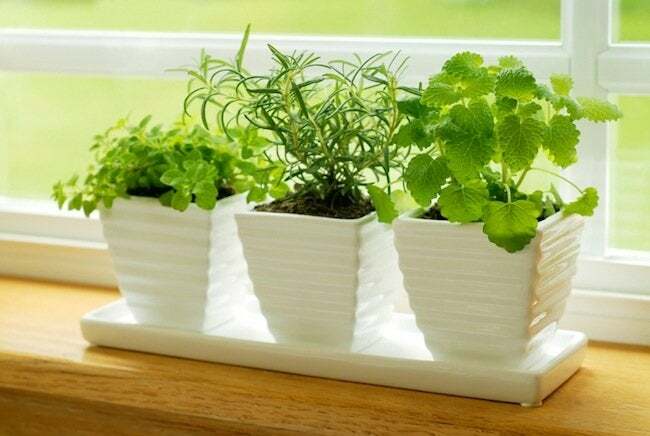 Besides decorating the windowsill, indoor herb gardens enable you to keep flavorful herbs on hand year-round. Fresh herbs add flavor, fragrance, and sophistication to your cooking—and they can’t get much fresher than those you have grown yourself. A good way to keep fresh herbs on hand, whatever the season, is to maintain an indoor herb garden. There are many advantages to growing herbs indoors. For one, your crop is always nearby—no need to go foraging outside—and you’ll have herbs available year-round. You won’t need to weed, and you’ll have fewer pests to worry about. On the minus side, however, herbs grown indoors tend to be less lush and flavorful than their outdoor counterparts. And as indoor space tends to be limited, you need to plant selectively. The right location and soil are crucial to success. Herbs need lots of sunlight—as much as six to eight hours each day—to thrive. If you don’t have appropriate south- or southeast-facing windows, consider grow lights. For best results, use a soil-less potting mix and water carefully whenever the medium is dry to the touch. Either plant each type of herb in a separate container or group together herbs that have similar watering needs. Harvest frequently to encourage growth and discourage blooming (but more lightly than you would an outdoor plant). And bon appétit!